The Star Trac Pro 7600 treadmill has been a favorite among users in health clubs and now savvy shoppers can usually find one available online to buy for home use. 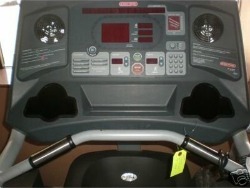 On the console, the IntelliTrac display guides the user through the set-up for each workout session. In addition to feedback for time, distance, calories, etc., there is an iPulse dedicated heart rate window for the interactive heart chart and a constant pulse detection feature. The preset workout programs include Dynamic heart rate control, fitness test, and firefighter test. Wt / Dimensions: 323 lbs / 65" x 34" x 58"
The Star Trac Pro 7600 treadmill is a commercial club model designed for heavy duty use, up to 16 hours a day, seven days a week. 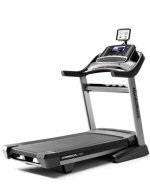 It features an outstanding 5.0 AC hp motor, a 15% incline, a polar and contact heart rate system, maximum shock absorption on the 20" x 62" deck with a triple-cell cushioning system, and a 500-lb max user weight capacity. 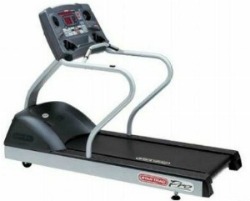 Since it is designed for health clubs, home owners considering the Star Trac Pro 7600 should be aware that this treadmill comes in either the 220 volt model or a 110 volt model. Either model must be powered on a dedicated circuit and cannot share line, neutral, or ground conductors with other outlets. Circuits for 110 volt models must have a 20-amp circuit breaker and 20 amp outlet; the 220 volt model must have a 15-amp circuit breaker and 15-amp outlet. With the correct electrical configuration, you will avoid potential problems such as low voltage that can adversely affect the motor and circuit board. Reviews of the 7600 Pro are very favorable for its durability and ease of use. It is also a very attractive machine, having been created by DesignWorks USA, a BMW Group company. The retail price on the Star Trac Pro 7600 is $7,495, and sold as a reconditioned model for $1,995 to $2,495. When you consider that used equipment is fully restored and priced at 50% to 70% off the retail price, you can see the value in it, especially a Star Trac Pro model priced this low. Remanufactured treadmills are often a bargain as they are fully restored by being stripped down to the frame, with bad or worn parts replaced, fully recalibrated, and the make-over will even include cosmetic touch-ups. If you have the space in your home for a 325-pound treadmill retired from a commercial facility, the elegant Star Trac Pro 7600 treadmill is a good choice.